Akzo Nobel has announced it has purchased the business and assets of Surrey-based Trade Paints. 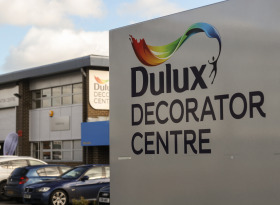 With three stores in Epsom, East Molesey and Sutton Akzo Nobel takes its total number of Dulux Decorator Centres in the UK to 209. I’m delighted to announce that, as of today, Trade Paints becomes part of the Akzo Nobel collection,” said Will Fenwick, Trade Paints managing director. Trade Paints will continue to trade under its current trading format from its stores in Epsom, East Molesey and Sutton operating under the leadership of John Henderson, Dulux Decorator Centre managing director.